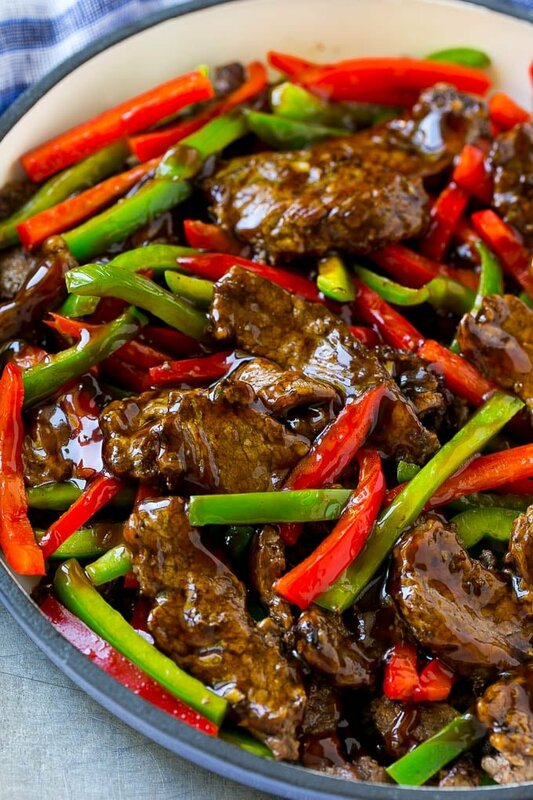 I always order pepper steak at my local Chinese restaurant, it’s one of my favorite dishes. This homemade version is ready in minutes and has that same great restaurant flavor. There’s nothing better than a delicious Asian dish that’s not only easy to make, but also better than takeout. 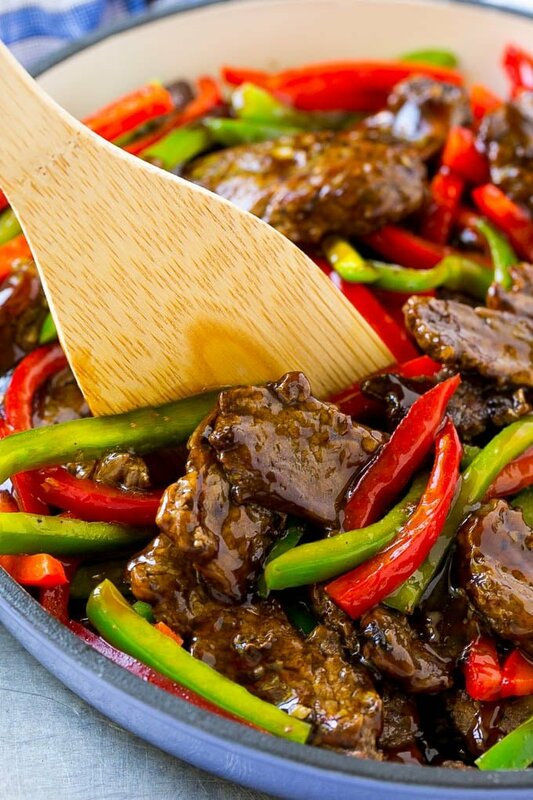 This pepper steak stir fry is a restaurant quality meal made in the comfort of your own home! 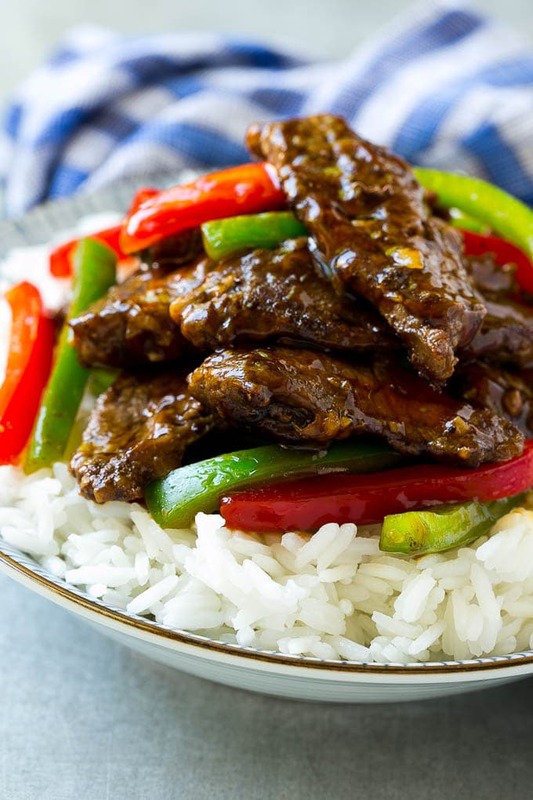 HOW DO YOU MAKE PEPPER STEAK STIR FRY? This dish is a combination of sauteed bell peppers, browned steak and a savory sauce. The recipe starts by cooking the sliced peppers until tender. The next step is to add the thinly sliced flank steak into the pan. The finishing touch is the 2 minute sauce which gets poured over the meat and vegetables and then simmered until thickened. Add a bowl of steamed rice and dinner is ready! 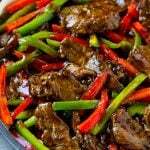 I used red and green bell peppers in my Chinese pepper steak because that’s what I had on hand. However, any color of bell pepper is perfectly fine. Some bell peppers are sweeter than others. 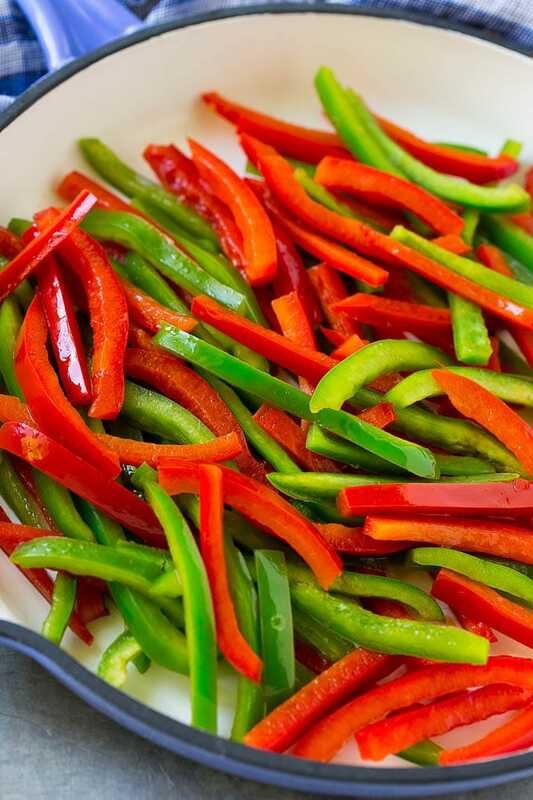 Red, yellow and orange peppers are typically sweeter than green peppers. Some pepper steak recipes call for tomatoes or onions, feel free to add those into the mix if you like. To make your steak easier to slice, you can place it in the freezer for 20-30 minutes. Partially freezing the meat firms it up and makes it easier to get super thin slices. 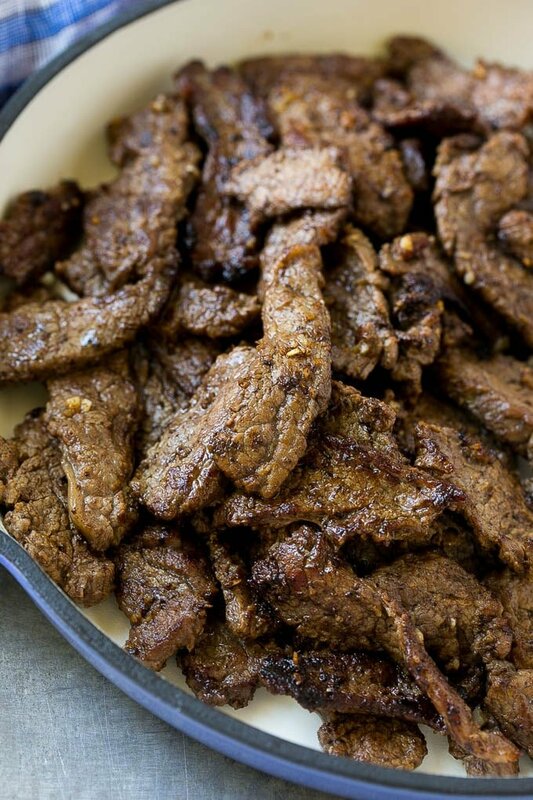 I typically use flank steak for this recipe as it’s readily available and super flavorful. However, sirloin goes great in place of the flank steak, if it’s preferred or if you have easier access to it. WHAT KIND OF MEAT IS PEPPER STEAK? Pepper steak isn’t an actual type of meat. The title can make it appear to be a specific type of steak but it’s just the name of the dish because it contains peppers and steak. The steak often used in pepper steak dishes is flank, sirloin, or round steak. CAN THE STEAK BE COOKED IN THE OVEN? If you would like to cook the steak in the oven, that’s perfectly fine to do, although you won’t get that seared brown crust. Simply make sure you don’t leave the meat in the oven for too long so that it dries out and becomes tough. You can place your steak in an oven proof pan and bake it for up to 15 minutes, depending on how well-done you like your steak. Be sure to stir it halfway through the cook time. My family and I absolutely love a good stir fry. It’s so much nicer to make this steak stir fry at home rather than having to get everyone together to go out and eat. We like serving it over rice or sometimes eating it by itself. Either way, it’s delicious. Heat 1 teaspoon of the vegetable oil over medium high heat in a large pan. Add the peppers and cook for 3-4 minutes or until just tender. Remove the peppers from the pan and place on a plate. Add the remaining oil to the pan. Season the flank steak with salt and pepper to taste. Increase heat to high. Add the steak to the pan and cook for 5-6 minutes or until lightly browned. Add the garlic and ginger, then cook for 30 seconds. Place the peppers back in the pan with the steak. In a small bowl, whisk together the soy sauce, sugar, 1/4 cup water and cornstarch. Pour the sauce over the steak mixture and bring to a simmer. Cook for 2-3 minutes or until sauce has just thickened, then serve. Delicious! My family thoroughly enjoyed this recipe. I always read the comments, and at the recommendation of a few others, I added onion. 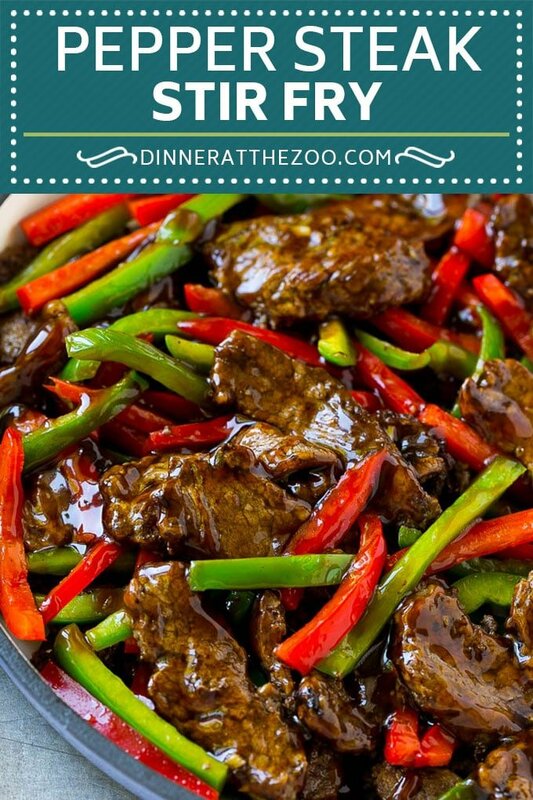 Thank you for a tasty, quick, and easy pepper steak stir fry recipe. I made this this evening – we like our flank steak rare so I marinated it for 24 hrs in V-H med garlic sauce. Then I broiled the steak separately. I used 1/2 a yellow and 1/2 an orange pepper, sweet onion (1/2), mushrooms, 4 garlic cloves and fresh ginger. Turned out beautifully – thank for your recipe!! This is an awesome recipe and it really does taste better than take out! Everyone loved it. I added vidalia onion and probably put extra garlic and ginger in (I did not measure) . I like spicey so I also added a little hot chili oil to my plate. I plan to make it thai style next time by adding some thai basil. Thanks for this recipe! My mom made this all the time when we were growing up. 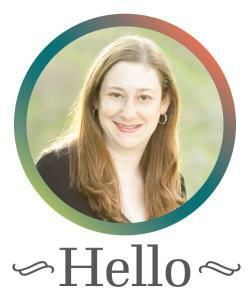 (I’m 63 now.) I’ve misplaced my recipe, but your’s looks very much like it, except ours had onions. Making it tonight for the grandarlins. I am on a sodium free diet (1500 grms at the most) How can I reduce the sodium in this recipe? I would recommend using low sodium soy sauce and you can cut the amount of soy sauce by 1/3 if needed. I cut the Soy (lower sodium) in half and it was still very good. It makes it salt safe! Do you have to use sugar in the sauce? You could use sugar substitute instead, or some other sweetener such as honey! I made this recipe tonight and we loved it! I had chuck steak that was already cooked, so I sliced it thin, added 1/2 teaspoon of sesame oil, and used it. I didn’t have fresh ginger so had to use the powdered instead. I added a carrot cut into match sticks and cooked it with the peppers. Thanks for a delicious, easy recipe! Just made this for dinner, I was a huge hit! My husband and my boys told me it was so good as they went for seconds. Thank you for this amazing recipe!